I called my instructor at around 8:30am to make sure that I wouldn't drag him out to the airport only to cancel the flight due to weather conditions. CFIs don't get paid for their time unless a lesson transpires. Since he was going to be there anyway, I kept the lesson scheduled and would do ground work if we couldn't fly. but fortunately they were blowing nearly straight down runway 34L. An AIRMET (Airman's Meterological Information) for moderate turbulence below 12k feet covered the area. I had seen a few pilot reports (PIREPs) for moderate and severe turbulence earlier in the day at altitudes near our usual 3000 feet: moderate around BWI and a severe turbulence report near Roanoke (over 130 miles away). After reviewing the weather again and calling the AWOS phone number to get up-to-the-minute conditions, we agreed to make the flight and took off around 1945Z. It was a little bumpy, but not nearly as bad as my night flight back from Richmond; I didn't experience any large altitude excursions as occurred during that trip. 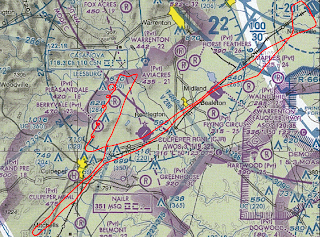 We practiced the cross-country routine of intercepting the course line and tracking time between waypoints, only there really wasn't a course--I reused my HEF-CHO sheet from a solo flight. I didn't realize this was going to be part of the exercise ahead of time, so I hadn't recalculated a wind correction angle and ground speed. 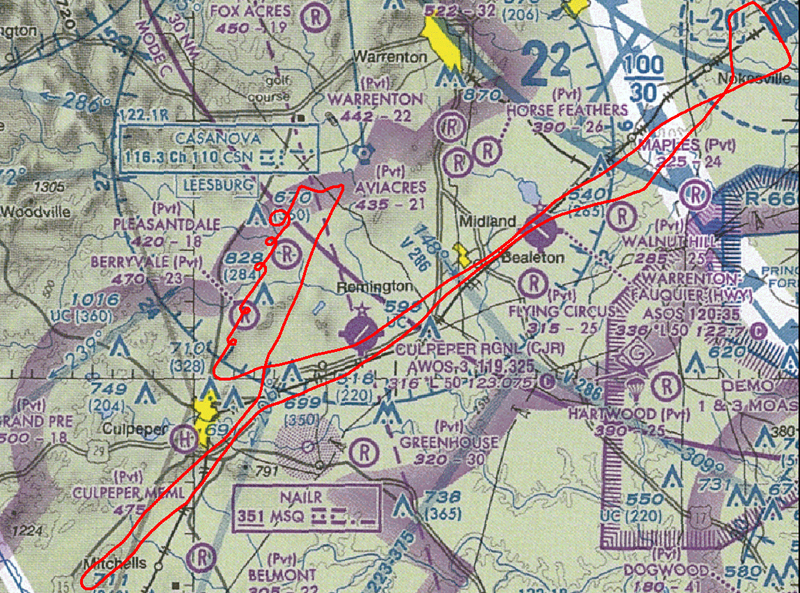 I was guessing at the crab angle, and wound up sliding over Warrenton airport. I used pilotage from there to get to Culpeper and Mitchells (abeam a tower on a hill), and then we simulated a diversion to Culpeper. I forgot to simulate opening a VFR flight plan with Flight Services (since I hadn't really filed one). I also neglected to run through the enroute climb and cruise checklists. This is easy to do because there really isn't much to do: the fuel mixture stays full-rich below 3000 feet in cruise for a C172. The checklist mistake is a checkride buster, so I won't let that happen again. My steep turns were mostly within the FAA Practical Test Standards (PTS) , but they were not as good as I want them to be. In one of the unusual attitude recovery maneuvers, I didn't close the throttle before recovering from a dive--first time I've botched that one--but the airspeed was still well below Vno when I recovered. The landing at Manassas was interesting with the strong, gusty headwind. I didn't use any flaps and started the approach a little high, carrying more power than usual. I pulled the power back and quickly developed a high sink rate, finding myself low in a hurry. I had to add full power for a bit, needed some coaching getting the crosswind correction dialed in with the gusts, and landed long. It wasn't pretty. The approach profile with no flaps and a strong headwind felt foreign. More practice is clearly required. Fortunately, the weather looks good tomorrow so I am planning to fly solo for more practice.